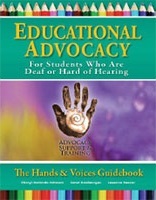 We’re parents and families with children who are deaf or hard of hearing (DHH). Most of us are hearing ourselves (95% of us, according to the statistics) and our DHH child might be the first person with hearing loss we’ve ever met (not counting Great Aunt Louise). Wherever you are in your parent journey with your child…whether you’re talking, signing, cueing or combining, or even if you have no idea yet what the best communication mode will be, you’re welcome here. Whether you’re child is newly identified with a hearing loss or a senior in high school, you’re welcome here. This is Hands & Voices…we’re parents who are trying to make the best decisions we can for our children from birth until they leave the nest. It helps to share with each other so we started this blog. Welcome to this parent community. Please be nice. We’re all trying the best we can and would never hurt anybody’s feelings intentionally, so thank you for being sensitive with your remarks to the diverse perspectives shared on this blog. We reserve the right to moderate comments and will not publish anything that gives offense. If we have missed the mark for you, please let us know and we’ll try harder the next time.